Augusta - Brooks Koepka could become only the third modern-era golfer to capture three of four consecutive majors this week, teeing off at the Masters for the first time as a major champion. Koepka missed last year's showdown at Augusta National with a left wrist injury, then bounced back to defend his US Open title at Shinnecock Hills and hold off a late charge from 14-time major winner Tiger Woods to capture last year's PGA Championship. "I wasn't doing anything last year. I was still in pain. 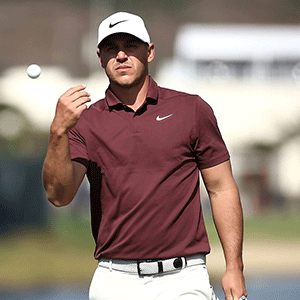 I still couldn't push down on a shampoo bottle to get anything out," Koepka said Tuesday. "It was a blessing in disguise. I think that was something I needed to really kind of find my love for the game again, to sit down and watch and really realize how much I do miss this game, assess where I was at. "And then to come back and to have the year I had was impressive because I don't think anybody saw that one coming." Woods, who won four majors in a row in the 2000-01 "Tiger Slam", and Ben Hogan -- who captured the 1953 Masters, US Open and British Open -- are the only players to win three majors out of four, a feat Koepka would match if he dons a green jacket on Sunday. The 28-year-old American's major shockers have fans at Augusta National curious about how Koepka will handle the lightning-fast greens and formidable shotmaking required at Augusta National. He has steadily improved in three prior starts -- finishing 33rd, 21st and 11th from 2015 to 2017 -- but that was before he had won a major. "I've got three trophies that I haven't had any time I've teed it up. I've never been a major champion when I played here. Completely different player probably," Koepka said. "Understand how to handle pressure a lot better. Understand this golf course a lot better. Even sitting out a year, there are certain things you can pick up on when you're watching. "And really matured on and off the golf course, I think, is a big deal. Everything has come at me fast over the last 18, 20 months, and learning how to deal with that now, I'm becoming a little better at it, so that makes everything a lot easier." That includes spoiling fan hopes of a 15th major victory by Woods just as he did last August at Bellerive. "I think I already spoiled everybody of their dreams the last time we played. So, sorry," Koepka said. "It would be cool to see him win. I think everybody in the field would love to stop him. I mean, I enjoyed stopping history. I had a great time." Koepka, last year's US PGA Player of the Year, won in South Korea last October and was runner-up in the US PGA Honda Classic but still has more major wins than non-major PGA triumphs. "I haven't played as well as I would have liked in the beginning part of the year, but over the last couple weeks, I've seen some solid results, and I like where my game is trending," Koepka said. He also enjoys being back at Augusta National, where as a child his autograph request was snubbed by Phil Mickelson. Now Koepka will be teeing off Thursday just after the three-time Masters winner, as the last man in the last trio alongside three-time major winner Jordan Spieth and England's Paul Casey. "Once you play it a few times, you learn some of the subtle nuances," Koepka said. "If you hit a lot of greens and leave yourself some uphill putts, you're going to have some good chances."